It's great to see toy companies making toys for preschoolers to learn logical thinking skills and foster creativity and engineering skills. 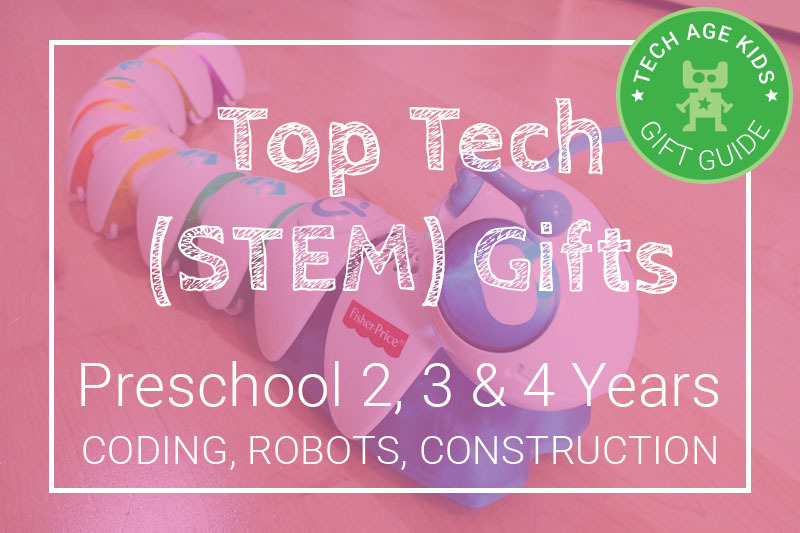 Our gift list for preschoolers, kids aged 2, 3 and 4, is aimed at young children. It is important to note kids develop at varying rates. We recommend you select toys you think will be appropriate for your kids, and not only look at age recommendations (see our note on age recommendations below). Dough Universe from Tech Will Save Us teach kids electronics concepts through play. Dough Universe is made up of three separate sets - light, motion and sound. Electro Dough is available from the Tech Will Save Us website. Read our full hands-on review of the Electro Dough Kits. We recommend a number of coding toys and robots for preschoolers. See our Expert Picks. Parents and grandparents may remember the famous storytelling bear Teddy Ruxpin from the 80s, which was relaunched this year as an interactive and cuddly bear packed full of new technology. He has LCD eyes with over 40 animations, animatronics which helps him look "real" and two modes of play - with or without an app. The app is available for iOS and Andriod. He also comes with 3 stories and has a sing-along mode. game or race and is a sneaky way to kids active physically whilst playing a fun digital game. They need to pedal to engage with the app. The Think and Learn Roctopus from Fisher Price let's kids learn cause and effect through music. Perhaps the start of coding with digital music. there are different instruments which they can use to create their own sounds. Following instructions in games is a great way to teach sequencing and patterns. This toy doesn't require an app to work but you will need batteries. Design and Drill is another classic toy, which got a bit of an upgrade with a lights and sounds version - Brightworks. It's a preschool version of making pixel art. Young kids will learn about turning clockwise and anticlockwise, and follow a pattern by copying a design. The new Brightworks set, makes it less of a "boy" toy, and who says girls don't like to operate a power drill! There are many different construction kits available in this age category. Read our overview and comparision article here - coming soon. Construction kits for young children help develop skills that will be useful later, like engineering, design and physical dexterity skills. Magformers are plastic, magnetic building shapes and this year they have a walking robot set. The set is compatible with other Magformers sets and includes an engine block which requires batteries to operate. It is important to note that although the robot is motorised, it's movement is small and slow. Kids enjoy building different patterns and structures with the magnetic shapes. This set is not recommended for kids under 3 years due to small parts. Magformers are another construction kit that comes out time and time again for play in our house. We love the games from Smart Games, which promotes logical, critical and problem solving thinking skills. There's lots of different ones, but we really like the three little piggies game to get young kids into solving puzzles using a familiar story. It's a single player game and recommended from ages 3+. The Three Little Piggies include 48 different challenges to solve, helping kids go from starter to master. Smart Games also have puzzle toys made from wood, like the Camelot Jr set. In this younger age bracket, children develop at different rates. Something suitable for one 3 year old may be too advanced for another 4 year old. We've tried to select toys that can be used differently depending on your child's age, developmental stage and dexterity. The games and toys included in our preschool list, is suitable for young children, but can also be enjoyed by older siblings. It is important for parents to gauge if your child is ready for a specific toy or gadget. The last thing you want is for a child to break a toy they are not quite ready to realise its full value. You may want to also look at our gift list for the next age range (6+).